Woody and Buzz are back in Toy Story 2, but this time it's Woody who's in trouble and Buzz who must go to the rescue. Will Buzz escape the Emperor Zurg and the machinations of the "other" Buzz in time to keep Woody from going to Japan? Toy Story 2 shares another excellent example of true friendship, and it deserves a place in any collection of family movies. 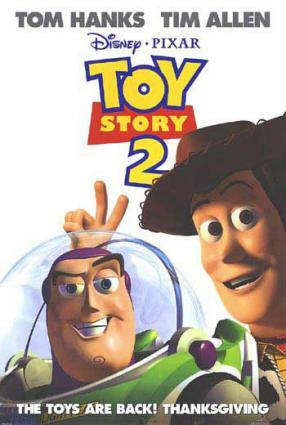 When Toy Story 2 begins, Woody is excited to be going to cowboy camp with Andy, but he can't find his hat. When Andy comes to get Woody to take him to the car, Woody's arm is accidentally torn, and Andy decides to leave Woody behind. Andy's mom puts Woody on a high shelf, where he finds Wheezy, a penguin toy with a broken squeaker. Andy's mom gathers up toys for a yard sale, and takes Wheezy. Woody tries to rescue Wheezy, but ends up being mistaken for a toy in the yard sale. An eager collector offers Andy's mom $50 for him, but Mom says that Woody is not for sale because he's an old family toy. The collector creates a diversion and steals Woody while Mom's back is turned. Buzz and the other toys witness Woody's abduction, and mount a rescue effort. Buzz, Mr. Potato Head, Rex, Slinky Dog, and the Piggy Bank figure out that it was the chicken mascot for Al's Toy Barn who stole Woody, and they find a map to get to the toy store. Off they go to rescue Woody. But in the toy store, a series of mishaps causes Buzz to be confronted with another Buzz, who doesn't realize he's a toy and who imprisons the real Buzz and then joins the other toys when Rex reveals that he knows how to conquer Zurg. All of them follow the Chicken Man to his apartment to track down Woody. But none of them realizes that Zurg has been released from his box when the real Buzz finally escapes the toy store. And Where Is Woody, Anyway? Meanwhile, Woody is in the Chicken Man's apartment across the street. He's been confronted with his past. It turns out that Woody was the lead character in a 1950s kids' show. Along with Jessie the Cowgirl, Bullseye the Horse, and the Prospector (Stinky Pete), Woody was the focus of a major marketing campaign with all the frills: toys, games, books, records ... the works. Woody is overwhelmed. And he quickly finds himself torn between his desire to get back to Andy and his yearning to keep Jessie, Bullseye, and Prospector from being returned to storage. The Chicken Man wants to get rich by selling a complete set of Woody's Round-Up toys to a museum in Japan. He has Woody professionally restored and sends photographs of the group to the buyer for the museum, who offers him a tremendous sum of money for the collection. He packs up the group to prepare them for the flight, but then is distracted by phone calls, leaving them unsecured while he tends to business. When Woody's friends find him and try to take him with them, he refuses to go. Then, after a sudden change of heart, he finds that Stinky Pete is not going to let him go. Bitter at having been rejected because he was the bad guy in the show, Stinky Pete doesn't want Woody and Jessie to take Bullseye and go to Andy -- Pete wants to go to the museum, where his new-in-box condition will make him the most valuable piece in the collection. And then Zurg shows up to kill Buzz, and mayhem ensues. Chicken Man manages to pack the Round-Up gang for the trip to the airport and even gets them checked in as luggage. But Buzz and the others are right behind them, and they invade the baggage-conveyor area to find and rescue their friend. And they manage it, but only after a harrowing ride on the conveyors. Stinky Pete is unboxed and sent off to learn what it is to be loved by a child. Woody and Buzz rescue Jessie from the plane just in the nick of time, and Woody convinces her to go with him to Andy's house. The toys return home shortly before Andy returns from cowboy camp, and Andy is ecstatic with the new toys. Andy fixes Woody's arm (which Pete had re-torn in the final battle), Mr. Spell fixes Wheezy's squeaker, and all is well in Andy's room once again. 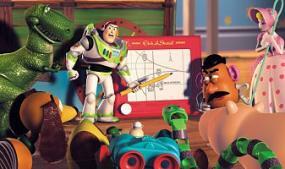 Pixar has cleverly disguised many references to its other movies and shorts throughout Toy Story 2. For example, the restoration artist is Gerry, from Gerry's Game, the short that preceded the feature film A Bug's Life. Other references to previous Pixar works will amuse and intrigue Pixar fans who are in the know.